You might have seen kniphofia in more modern gardens. 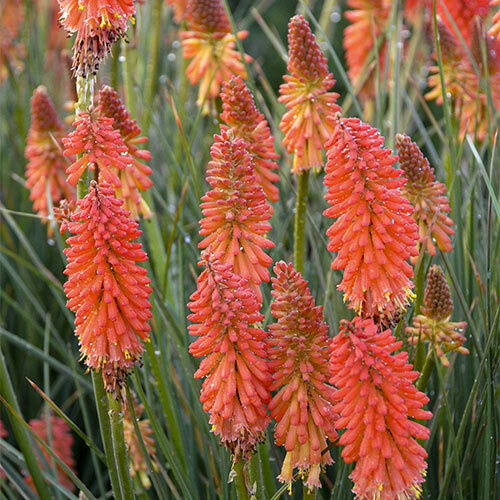 Also called Torch Lily or Red Hot Poker, this South African superstar has recently gained in popularity, specifically for its easy nature and stand out style. And Poker Face is one of the most fabulous. Weeks of blooms and even possibly the occasional reblooming makes certain that this unusual feature will be a treat to savor. In deeper orange-to-red shades, it glows like a hot coal in a July border. It's easy to care for in a sunny, well-drained spot, and is even drought tolerant once it matures. Snip a few blooms and add some fire to your fresh bouquets. Poker Face Kniphofia is loved by bees and butterflies. Foliage TypeSword shaped gray-green leaves. Flower FormIndividual tubular flowers clustered around the top of each stem in a narrow spike. Soil RequirementsRich well drained soil. PruningTo remove spent flower spikes. After flowering. Winter CareOne of the best winter hardy kniphofia still best to mulch newly planted plants for the first winter. Planting InstructionsAvoid windy areas and wet winter conditions that may cause the rhizomatous roots to rot.